This time the spotlight will be shining on RobotSplit, a puzzler that takes place in… robot hell! Oh man. What better reason to help it escape the cold emptiness of Greenlight limbo? RobotSplit is a retro-inspired puzzle/platformer made in a modern way. 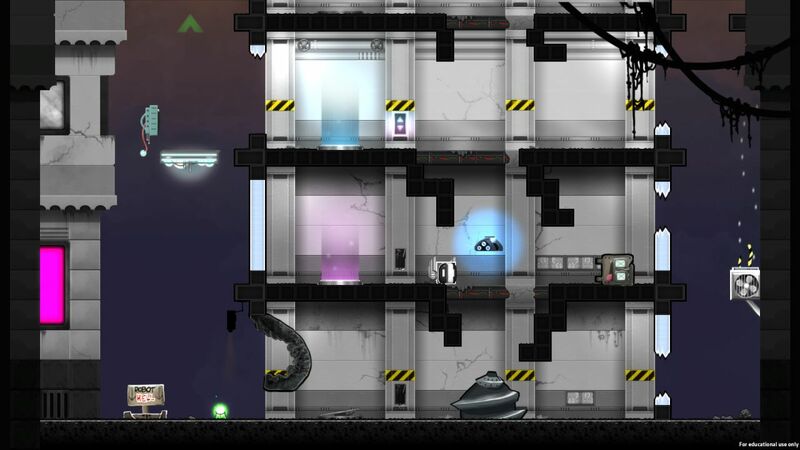 You play as Stix the Robot as he has to explore planet Örf and the depths below. Will you overcome the challenges of Robot Hell or accept defeat? Needless to say, Stix isn’t like most robots, as he can split into multiple pieces, enabling him to access otherwise out-of-reach areas, maybe even flick a switch or two along the way. Hardly the most original mechanic for a puzzler, sure, but the execution seems to be be spot-on, and really, isn’t that what matters most? That and the art style of course, which, while lovely, is definitely not what I’ve come to expect from robot hell. Where’s the lava, all the furnaces, robot slaves etc.? Right… Anyway, hell is for other robots, and here’s to RobotSplit providing plenty fun brainteasers, come launch! So riddle me this, dear reader: why is RobotSplit still struggling to get through Greenlight? It ain’t out yet, but should be at some point. For now, how about visiting its Greenlight page and handing over a ‘yes’, if you like what you see? Remember: your vote matters!